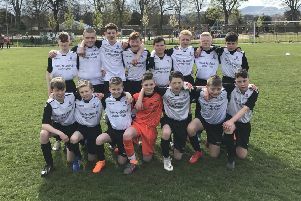 Two goals in the final 15 minutes ensured a league and cup double for Danderhall Miners as they saw off Edinburgh Uni 2-0 at Ainslie Park in the Challenge Cup final. Having already secured top spot in the Championship earlier in the week, Hall were frustrated by their opponents in the early stages of the contest. Uni looked the more promising of the two sides as Phil McNicholas and Kyle Brown went close, only to be denied by Hall goalie Thomas Cordery. Hall almost scored just before the break. but Daniel Taylor’s cross from the left was headed just wide by David Curran. It was the same pattern of play after the interval with both sides not having any real clear goalscoring opportunities. But with 15 minutes to play Hall made their moment in front of goal count. Taylor whipped a corner in from the right which Darren Anderson leapt to nod in at the front post. The momentum was now firmly with Hall and they wrapped up victory with a second goal. Substitute Grant Aitchison chased a through pass down the middle and shot beyond Uni keeper Jan Sieller, sealing cup glory. Hall face Shotts Victoria in the South Of Scotland Cup final tomorrow night as they bid for a third honour of the campaign. Edinburgh South Vics wrapped up title success with a 6-0 win over Haddington Athletic at Whittinghame Drive. The Edinburgh East Division leaders scored three goals before half-time. Gordon Ramsay cut in from out wide before slotting into the bottom right corner; Robert Bennett fired an effort just outside the box through Haddington bodies and into the goal, and with half-time apprioaching Vics made it 3-0 as Ramsay hit a stunning 30-yard strike which crept just under the bar. Keith Cairns scored the fourth early on in the second half. Vics grabbed a fifth not long after. Lee Watson played a one-two with Jai White ending in the former heading the ball in from close range. It had been an impressive performance to end the season and Vics still had time to make it six as Scott Waterstone got his name on the scoresheet. East Linton kept their Premier Division hopes in the balance as they defeated South Gyle 5-0 at Gyle Park. Under pressure to pick up the points in the title hunt, Linton took the lead with 12 minutes gone as Jules Anderson picked up a square pass from out wide on the right before steering the ball across goal and into the bottom left corner. It quickly settled any nerves and they soon had another. Callum Hill fired in from the left of the box to boost his side’s advantage. Then, just before half-time, Linton scord another. Greig White hit a peach of a strike from range into the top left hand corner of the goal. It was more of the same after the break as Linton dominated, picking up two more goals. Bob Wood’s free-kick made it four and Anderson grabbed his side’s fifth with a neat finish following good work by Michael Macfarlane. The league title hangs in the balance with Edinburgh Rose facing Linlithgow Thistle this week. A win for Linlithgow will hand Linton the title because of their better disciplinary record. Any other outcome hands the league honours to Rose.